When it is time to act, go ahead. I am showing you this particular coffee mug because I've been staring at it for the past six years while I've been working on this book. 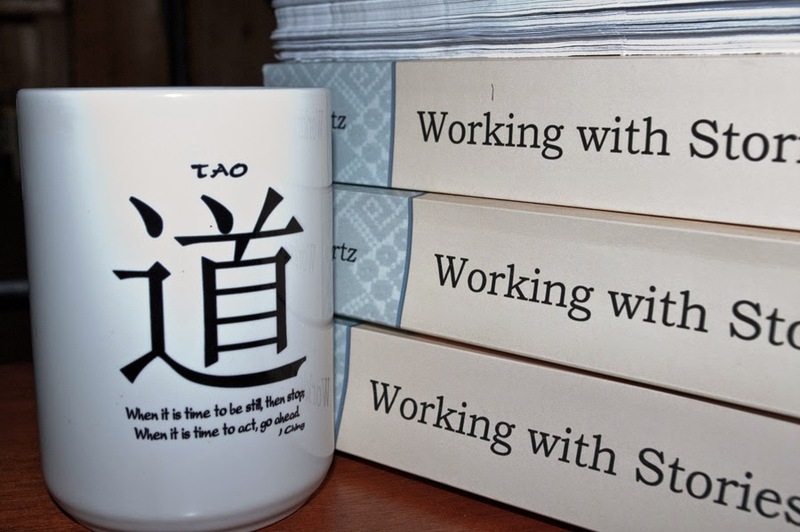 Every time I have looked at this mug, it has said the same thing to me: "Keep working. It's not time yet." Working on this book project has been a long journey. "The book" has been such a constant presence in my life that my heart has seemed sometimes to beat with the sound of "book-book-book-book." At times the book has been a shining beacon, and I have rushed toward it with excitement. At other times the book has seemed a horrible mistake, and I have wandered the dark landscape of doubt. What has kept me going through all of these years? Two things. First, the unflagging support of my husband and son, who never stopped believing that I could do what I set out to do, even when six months turned into a year and one year turned into six years. The other thing that kept me going was you. Every time I felt like the world didn't care if I ever finished the book, somebody would send a "thanks for the great book" email and ask me a few questions, and my energy would rise again. Everyone who has ever written to me: without you I could not have finished the book. I am sure of that. There are those among you who have done much more than others. You know who you are, and you know how much I appreciate your help. So, what have I done to "the book" since I put out the "finished" version in December? I moved the book from Scrivener to LaTeX. I learned more than I ever wanted to know about LaTeX, book layout, and self-publishing. I met CreateSpace's arcane print requirements. I incorporated suggestions from helpful readers. I rearranged book parts some more. I smoothed transitions between book parts. I removed fifty pages of redundancy, excessive detail, and unnecessary diversion. I added a detailed, embedded index that works in both print and electronic versions. The index was professionally built for me by Ellen Kaplan-Maxfield at middleofthenight.org, who (if you can believe it) is as obsessive about quality as I am. I wrote a glossary. I designed the book's cover. I met the arcane requirements for publishing in the Kindle and ePub formats. I obsessed over every little thing. I did that for quite a while, to be honest. Finally the book told me that it was done, or done enough, for me to stop holding its hand. I stopped obsessing. I took some deep breaths. I uploaded the right files to the right places. I wrote this blog post. How long is the book? 682 pages. I am very sorry about that. I tried my best to shrink it. As I said above, I removed about fifty pages of redundant and digressive writing. I reduced the white space as much as I dared. I formatted the text in two columns to squeeze more words onto each page. For a while the book got quite a bit shorter. But by the time I added the glossary and index, wrote about fifteen new pages on topics I had realized were not well covered, and increased the figure sizes so you could read the words in them without squinting, the book grew longer again. At least now I think those 682 pages all have to be there. Without an editor to put every sentence on a diet, this is the shortest the book is going to get. If you have enjoyed reading the posts on this blog, or if you have read any of the endless pre-publication versions of Working with Stories online, here is what it is now time for you to do. If you like the book, please tell people about it. If you have a blog, I'd appreciate a post. If you are on a mailing list related to stories, you could mention the book on it. Help me tell people about the book. If you have read the book, please consider posting a review on the book's amazon.com page. Say what you like! Tell everyone how long-winded I am, and how I'm not as funny as I think I am; but fill up that bar chart for me. If you like the book, please buy a print or Kindle copy of it (or make a donation for an EPUB or PDF version). If you like the book a lot, consider buying two copies and giving one away. Consider this blog post my Kickstarter campaign, only you don't have to watch me try to be funny in a video, and I won't be sending you upbeat progress reports (not that there's anything wrong with that). I would really love to keep doing this work. Having sunk so much of my time into this book project (about 2.5 person years so far), I can't keep this up if I never make any money on it. Your reward for doing any or all of these things will be my undying gratitude combined with the knowledge that you helped to bring the book to people who need it. Plus I'll be really grateful. What's next? To begin with, my first vacation in years. I plan to spend a few quiet weeks pottering around in my yard and garden (though I'll keep answering comments and emails, so go ahead and say hello). After that, I will finish the last few sections of the second book (More Work with Stories) and prepare that book for publication. Luckily I have made every possible mistake while preparing the first book, so the second book should go faster. After that I would like to finish one or two books of essays. All of this is on top of the usual on-and-off client projects. I have one more announcement to make. Because I have finally passed the endlessly receding milestone of "when the book is done," I have decided that I will return -- gently, slowly -- to blogging. Hooray! I hereby promise to write at least one blog post per month, starting, um, next month. I'm not making any promises about the length of these blog posts, mind you, but I will try to write something interesting about stories and/or complexity at least once a month. I look forward to hearing the blog's little feet pattering around in my mind again. So thanks again everybody, and you'll be seeing me around more often. I am a researcher, writer and programmer who works on the "listening side" of organizational and community narrative. More at cfkurtz.com. Author Ian McEwan - "There are ways of being wrong that help others to be right"
Can the international humanitarian sector adapt to the “new normal”?